Seat angle is generally understood to be the angle of the seat tube relative to the horizontal. 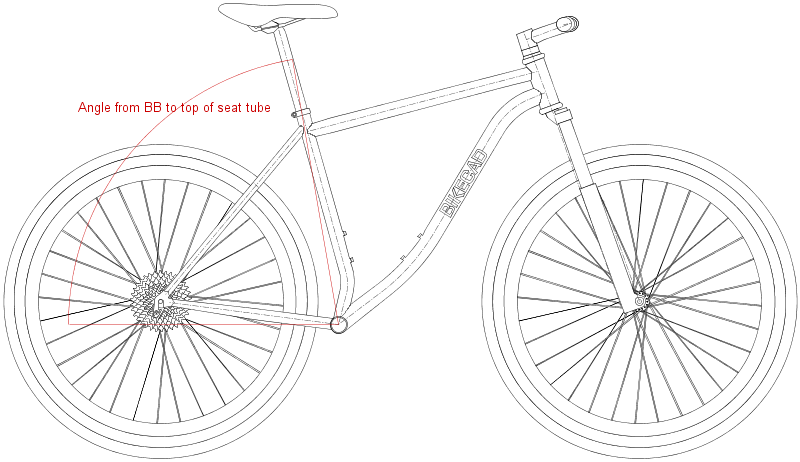 However, when a curved seat tube is used, there is potential for confusion as to how that seat angle should be measured. In BikeCAD, seat angle is always equal to the angle of the seatpost or in other words, the top straight section of the seat tube. When setting up a fixture, it may be useful to know the angle from the center of the bottom bracket to the top of the seat tube. In BikeCAD Pro, we can show this angle by selecting Jig setup >> Angle from BB to top of seat tube in the Dimensions dialog box. Another dimension that can be useful when dealing with curved seat tubes or with bikes that employ an unconventional amount of seatpost setback is the Effective seat tube angle.